The red scarf with the black dot pattern was a present from a Chinese friend, for my wife. 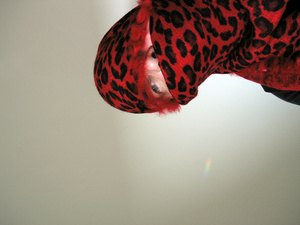 I created a series of self portraits with it asking myself questions about political issues reg. China, remembering a friend, Chinese rock star Cui Jian wearing a red blindfold in one of his most famous song videos, my transcultural life, and at that time including the arab spring movement, culture & religion clash etc. I decided it is meant as a gender neutral dadaistic call for love & peace. I then exhibtited the self portraits in Germany and at the PHOTO BEIJING 2014. 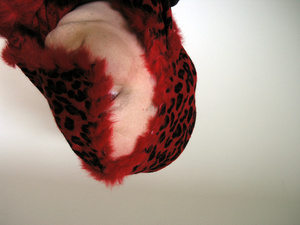 During an exhibition in Germany I shot the "self portrait with the self portrait with a red chinese scarf". The Chinese friend decided never to gift scarfs again to us ;-) but came to see the exhibition in Beijing.